Open letter to the top executives at Paramount: Yes, everyone knows that the Star Trek franchise is a very important part of your company and that Star Trek Into Darkness – the second in the rebooted film series – is crucial to your success not only this summer but this year. However, the cowards and cretins in your publicity department seem to think that unless the media is “managed” the legion of Trek fans around the world won’t go. Have you learned nothing from the fact that people even went to see the Star Wars prequels? By allowing some “special” critics to see the movie early while making most of us in the U.S. wait until the film’s opening night – even as reviews were already pouring in from overseas – all you have done is made a lot of critics angry, ensuring that whatever negative reviews the film gets will be even nastier than they might have been. Fire these idiots. They obviously know nothing about Star Trek, its viewers or, indeed, the movie industry. As for the film itself, it’s nice to report that the movie didn’t need to be “managed.” It is, in fact, precisely what was needed after the reboot four years ago. Star Trek worked despite a weak and confusing script because the casting and characterization was so spot on. Chris Pine was fine as the impetuous young James Kirk, Zachary Quinto and Karl Urban were astounding as Mr. Spock and Dr. McCoy, and the rest of the crew (Zoe Saldana, Simon Pegg, John Cho, Anton Yelchin) were entirely in sync with their roles. Audiences accepted it because it was a fresh introduction to iconic characters. Director J. J. Abrams and his collaborators neatly got the franchise out from under the burden of four decades of what was or wasn’t “canon” by hitting the reset button. 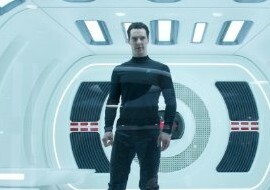 "Whether you’re a longtime fan or a newcomer, Star Trek Into Darkness delivers." Having served, in effect, as the pilot for the new series, the next film had to develop a solid story. It does, and details will not be spoiled here. After a mysterious man known as Hamilton (Benedict Cumberbatch) launches a deadly attack on Starfleet headquarters, Admiral Marcus (Peter Weller) sends the Enterprise off to a supposedly uninhabited area in Klingon space to take him out. It’s a delicate matter because the Federation can’t risk launching an attack in the area and getting caught. Then it gets complicated. Pine, Quinto and Urban do a marvelous job of bringing new life to the Kirk/Spock/McCoy tensions even as it will seem familiar to longtime fans. Cho and Yelchin are a bit underused in this outing – as Sulu and Chekhov – but get their moments. Saldana, as communications officer Uhura, and Pegg, chief engineer Scott, have slightly more substantial roles. As the story develops fans will figure out where it’s going which is why the new twists on the material keep it entertaining. It’s not simply a story we know with a new cast and more up-to-date special effects. It’s a reshuffle that has a few surprises in store. By film’s end it’s clear that Abrams really needed two films to fully complete his reboot. The next Star Trek movie will be even more eagerly anticipated because the elements are all in place now, and future editions will have more room to maneuver having convinced the fans that this is the real deal. Whether you’re a longtime fan or a newcomer, Star Trek Into Darkness delivers. Now if we can only convince the idiots at Paramount that there’s a reason the Star Trek franchise has survived for nearly fifty years. Big hint: it’s not because the movies and TV shows were kept from the critics. Daniel M. Kimmel is a veteran movie critic and author of a host of film-related books. His first novel, Shh! It’s a Secret: a novel about Aliens, Hollywood and the Bartender’s Guide has just been released. He teaches film at Suffolk University and lives in Somerville, Massachusetts.